9 October 2018, at 12:00a.m. Conspecific aggression has been extensively studied in growing pigs, and to some extent in sows, as it can negatively impact productivity. More disastrous situations can occur when the aggression is directed towards humans. Group housed sows will, similar to growing pigs, need to establish a dominance hierarchy when they first encounter. Although body weight or size does not always predict who the dominant animal will be, it is most likely that the heavier one will win the dispute. With the weight differences between sows of different parities, gilts are easy victims. Due to the heavier weight of sows as compared to growing pigs, aggression can be more severe. To minimise costs in terms of injuries, sows will aim to avoid direct aggression by showing agonistic behaviour such as threat and withdraw. Signs of avoidance behaviour and fear in the low ranked sows and gilts should be taken seriously to avoid production losses. For example, fear of entering the feeder space due to attacks of a dominant sow may cause the low ranked animal to miss out on meals. In addition, the stress associated with direct or indirect aggression results in a poorer feed conversion and can lead to abortion. Agonistic behaviour in the first 24-48 hours after regrouping is normal but should rapidly decline thereafter. 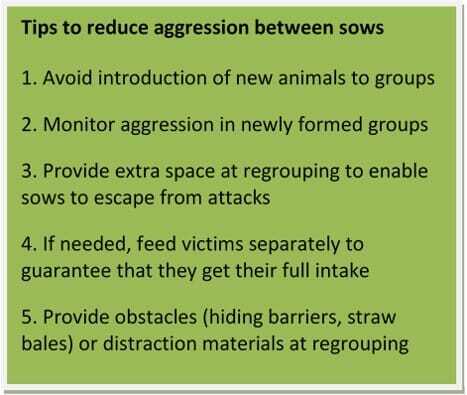 If agonistic behaviour remains frequent then it is best to take action (Tips to reduce aggression between sows) to avoid production losses and to improve the welfare of the sows. Conspecific aggression is largely unrelated to aggression towards humans. 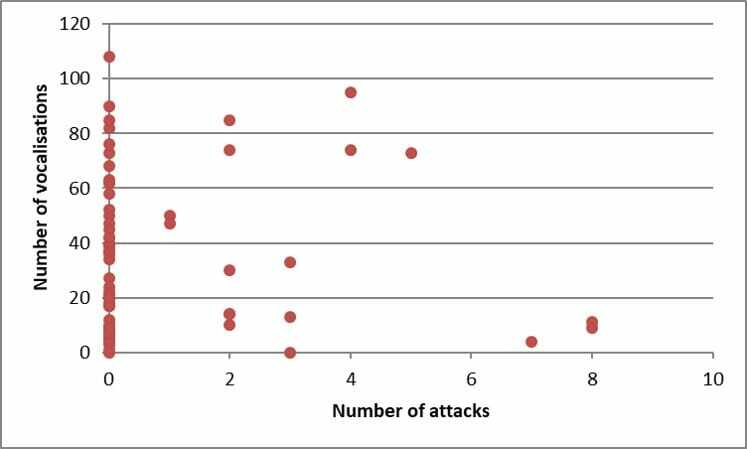 Therefore sow aggression at regrouping is not a good predictor of sows attacking humans. Especially during lactation, sow aggression towards the workers can make handling complicated. Considering that most sows are kept in farrowing crates, workers are relatively protected from the attacks. Sows can bite though the bars when piglets are being caught, and may even attempt to jump out of the crate. This extreme behaviour of sows indicates a high level of stress that is best to avoid even if worker safety is guaranteed. The distress vocalisations likely disturb the resting pattern of the other sows in the area and this may, in turn, lead to increased crushing of piglets. It can also disrupt suckling patterns and thus affecting piglet growth. Vocalisations are however not necessarily a sign of attack (Figure 1). Signs that can indicate an attack are biting in the bars of the crate and biting in the feed through. Sows that are not confined in farrowing crates (free farrowing) can more easily attack to defend their piglets. In such systems it is best to select sows on calm behaviour, to adjust management practices to reduce interference, and to create a good human-animal relationship preferably already at gilt rearing. At freefarrowing.org more tips are given, for example to let sows associate human contact with food by hand-feeding some silage or straw at inspection. For tips on managing loose-housed sows visit Free Farrowing.org. Boars show as growing pigs already substantially more aggression than gilts or barrows. Boars are also more persistent in their aggression against another male and may continue fighting even if they are exhausted and injured. Aggression and mounting behaviour in boars therefore more easily results in lameness, injury and a reduced feed conversion. Avoiding a slippery floor is one of the main aspects to be aware of when housing entire males. Providing distraction material at the peak of activity (depending on the season and feeding system, usually in the morning and afternoon) can reduce aggression as well. Distraction materials can be anything novel that is safe for the pigs to consume, such as straw, branches, jute sacks, non-printed paper, card board etc. When providing something it is important to give at least two items to avoid fighting over the resource. Removing pigs at slaughter weight to increase space allowance per pig will increase opportunities to avoid aggression or mounting behaviour when the sexual behaviour starts to increase. The removal of animals from the group may however lead to some aggression as dominance relationships will be re-established. Boars that are kept for mating or to assist at AI can become unpredictable in their behaviour as they mature. Already from six weeks of age boars show ritualised agonistic behaviour before they attack another pig. In their preparation to attack, they may start foaming (see image below), raise the neck hairs, or start chomping with their jaw. These behaviours are usually to signal their intent. Because fights between males can be very injurious, boars have evolved to show these signals. Although the moment that a boar may attack may be unpredictable, due to for example a change in hormone levels, the attack itself is likely preceded by one of those signals ('Tips to avoid attacks from boars'). In that case, never stand between the animal and the resource it wants to obtain (feed, female, space). It is best to select boars at an early age (even from birth) based on good body type, strong legs and calm but playful/curious behaviour. Do not select piglets from sows that show excessive aggression, as the behaviour can be inherited by the offspring. 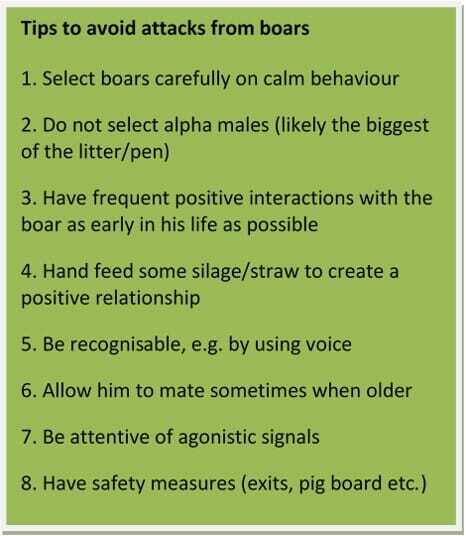 Also avoid alpha males that may show already dominant behaviour and aggression towards other pigs in early life. Have frequent interactions with the boar, preferably when he is young, for example by feeding it some treats by hand. Let the animal get acquainted to your speaking voice so that it later on can recognise you even in situations where you may be less visible. 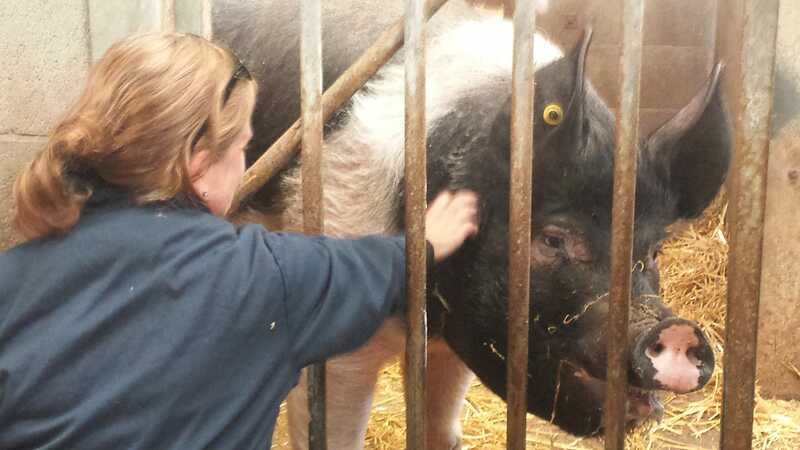 Pigs perceive their environment best through smell, and letting the animal smell your hand before handling gives another cue for recognition. In contrast to smell, pigs have poor vision and this may even be more so for boars with the longer hair that covers their eyes. Take this into account when handling; sometimes attacks may be out of uncertainty about the situation rather than aggression per se. Being predictable by having a routine in the handling and mating procedures can make animals calmer. Despite this, always take safety measures such as a pig board and have easy to open gates to avoid accidents. When boars come from a different farm or AI station it may take more effort to build a trusted relationship. In those situations it is even more important to familiarise yourself with the boar and to take extra safety measures. Irene Camerlink is a researcher at the University of Veterinary Medicine in Vienna (Vetmeduni) where she works on social behaviour in pigs and its relationship to neurobiology and animal welfare. She obtained a PhD in Animal Sciences (animal genetics and adaptation physiology) from Wageningen University, Netherlands, in 2014. From 2014 to 2018 she worked as postdoctoral researcher at Scotland’s Rural College (SRUC) in Edinburgh, UK, on aggressive behaviour between pigs and how this influences their welfare. She collaborates across Europe and Asia (including China) on topics related to pig behaviour and welfare.